Pulcinella restaurant serves authentic interpretations of Italian cuisine and wood-fired pizza in a historic building. 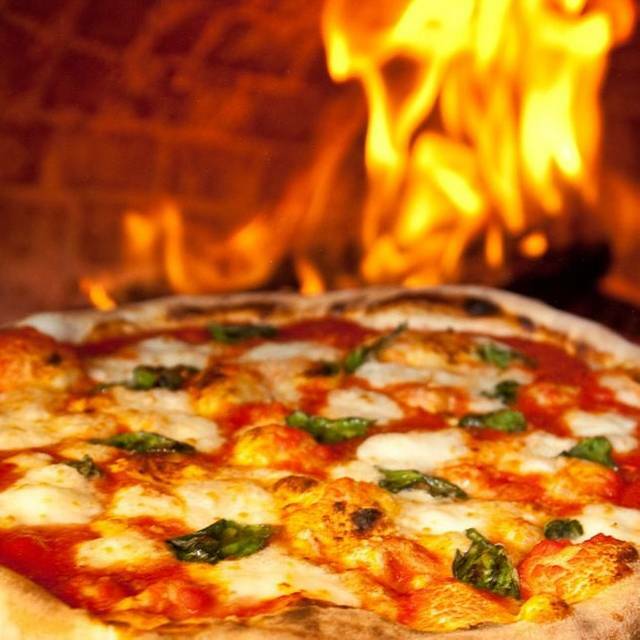 This landmark Italian restaurant specializes in Neapolitan pizza, expertly prepared using ingredients sourced from Italy and baked in a wood-fired oven. Pulcinella also offers fresh salads, pasta dishes and a fine collection of wine to complement meals. 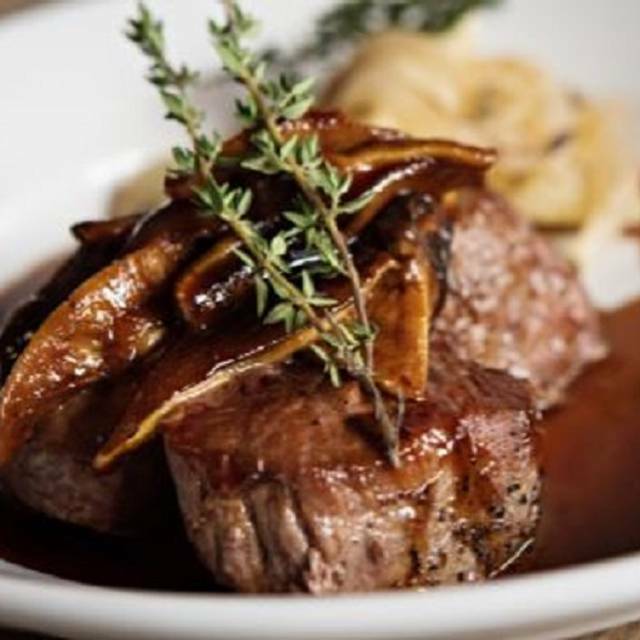 A neighborhood favorite, Pulcinella is an ideal choice for a nice intimate Italian meal. Guests get to dine in charming settings, featuring mural walls, crystal chandeliers and linen table cloths. Dishes are cooked to order, using fresh ingredients for the best flavor. This restaurant also offers private dining facilities that can be tailored towards private parties and special events. 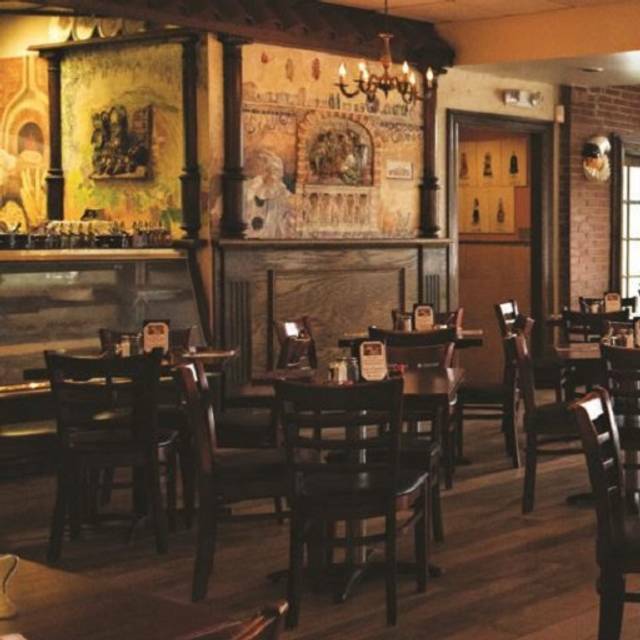 Pulcinella serves breakfast, lunch and dinner and is open Mondays through Sundays. Kids Eat For Free Saturdays! This has been my favorite place for quality Italian food for 25 years. I don't live in the area anymore, but any time I come home to visit, a stop at Pulcinella's is always a must. Can't recommend it enough! Try the fries Zucchini. Outstanding. Nice, small restaurant with excellent pizza and pasta. Family friendly too! Food was very good. We were late going to dinner which may explain the slowish service. Family friendly neighborhood institution. The service is always courteous and efficient, and the food is terrific traditional Italian fare. It’s our go-to place for big family dinners with all the grandkids, and it never disappoints. Our waiter was very attentive and provided good service. The food was a different story. It was a very disappointing meal. The Margherita pizza was more like a plain old cheese pizza with a basil leaf on top, the fried artichokes had too much breading which was served after the pizza was delivered, and the beef stroganoff left nothing to be desired. The one good thing was the bread. The house made food was amazing! Server was great. We were greeted and when leaving asked how was everything. They genuinely care about you! While u wait for your food. Competitively priced. Be sure to try the specials. We had two excellent pasta dishes and a delicious beet salad. My daughters birthday was in February. We enjoyed the food and the atmosphere! Thank you! Great place to meet friends for lunch and fine food. The food was good but it was Valentine's Day and the place was packed. Our service was very poor (my wife's beet salad was served but my soup didn't arrive until she was done, the entre took forever.) After a long wait, a new waiter came over and said he would get our meal fixed and to us. He provided a complimentary salad and the meal arrived soon after and that helped. We will try the restaurant again on a less crowded day. Had dinner before a show at Langley High School. Fabulous as always! This is a very nice restaurant. The food is very good. There are many selections on the menu so there is something for everyone. The ambiance is a casual, neighborhood feel. We got in there at 5:30pm on a Sunday and it was dead but then around 6pm people starting coming in and the place was packed by 6:15. Always enjoy Pulcinella. Never disappoints. Excellent food and service as usual. Service was excellent. Warm, welcoming atmosphere. Felt we could stay, enjoy our meal and conversation for as long as we liked. Food never disappoints...delicious! Had a wonderful time at Pulcinella's the other night--I can always count on outstanding food and service, thanks! This was a business lunch with my engineering team. The pasta is homemade and the marinara sauce is fresh and very good. We had ravioli (meat filled and ricotta filled), salmon, sole, bucatini and chicken all the dishes were good and the guys enjoyed the lunch. Would recommend for lunch, good food at a fair price. Met friends for lunch. We all really enjoyed the meals we ordered. We often go to Pulcinella. The food is great and it's right around the corner. Very comfortable setting, wonderful service, and the best, most authentic Italian food in the DC area. It is a very pleasant restaurant which always has good food. Options are limited on Christmas Eve, but Pulcinella is a good one. There can often be a line, so discovering that the restaurants is now on Open Table is a real plus: We were seated immediately. We've been coming here for over 30 years, so there are no surprises, just consistently good, warm bread and food just like your grandmother would make if she had been born in Italy. The house wine is a little rough (especially the red), but it complements the red-sauce food, and the kitchen takes frying to heart: The frito misto and fried calamari are just right. You can't go wrong with any of the pizzas, either. A great place to take the family! Fun neighborhood pasta place, fun for the family and for groups. Arrived early for our reservation and seated promptly. Waiter was very attentive but low key. Food is excellent with all pasta’s made in house. All had Veal and it was very good at this low price point. Appetizers of artichokes, zucchini and calamari all very good with the latter being the best. Desserts also good. Wife has the chocolate mouse cake and raved. My Canoli was very good. Will return on all my visits to DC. Family fun with great pizza and solid pastas. Very reasonable wine prices. Great place. Only a very loud and rude adjacent table (the father had no manners and was yelling across our table to talk to another family!) adversely affected an otherwise super dinner! Neighborhood find! Great local restaurant, friendly and great food! Nice place, I will go back again. Food is good, service excellent and restaurant is comfortable. Mushy pasta (overcooked), overly rich sauce, forgot the salad completely, seated us near the entrance to the kitchen even though the place was nearly empty. Really not worth the drive, or even the effort. Stay home and make your own pasta! We dine here regularly, this evening we had two children with us, ages 8 and 6. We waited 45 minutes for our food and the restaurant was not terribly busy. This is one of our favorite places to eat. We like the atmosphere, food and service. Pulcinella is a go-to place for us.. Good food. price, service, etc. We will continue going. The only problem I have is the pasta is usually overcooked. I would have given them a 5 star rating except for this. It is an Italian restaurante--cook pasta like you care. Veal choices at this restaurant were just okay -- not particularly special. Wine was offered just as white or red and was not very good. Perhaps having pizza there is the best choiced.